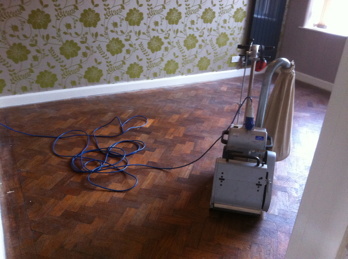 This photo set is a few pictures of floorboard and parquet renovation projects which haven't yet been uploaded to our online galleries. All the pictures in these photos are direct 'before' and 'after' pictures taken from pretty much the same vantage point in the room/area in which the particular project was taking place. 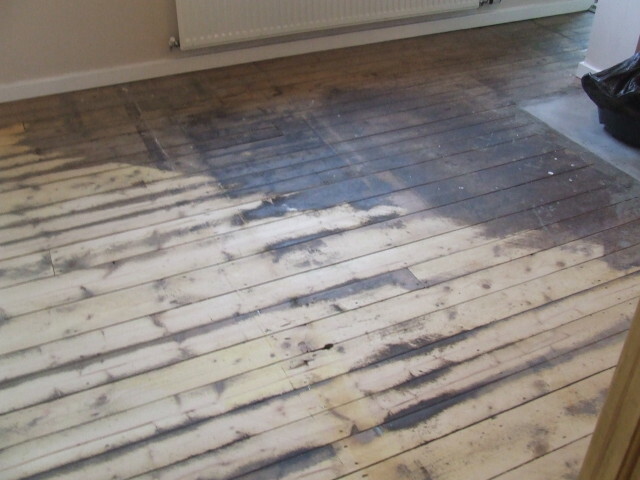 We have added some end user inter activity on this page, just move the cursor over the image and it will 'rollover' to show you the wood floor in its finished condition. Some of the images in this gallery portfolio are available for viewing in a video format on our You Tube Video channel. If you click on the 'You Tube' icon on your right, you will be whisked away to our You Tube Channel, where you can view the video clips we took of these particular projects in the 'before' and 'after' condition of the renovation. 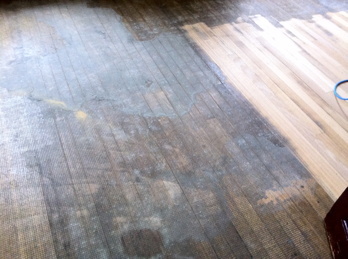 Recently completed Floorboard Renovations / 22 'Rollover' pictures in this photo set. More pictures will be added soon. 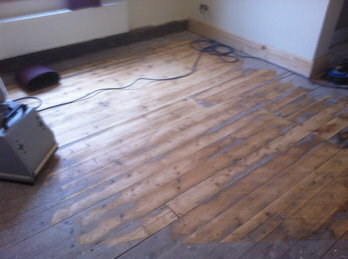 This old pine floor boarded floor in the Before & After condition - What a difference a day makes. 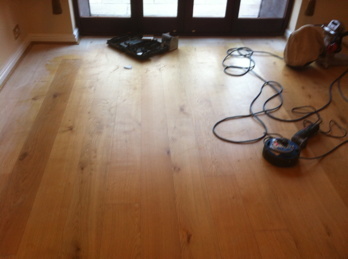 7" wide Oak Floorboards in the direct 'Before and After' condition, quite a dramatic change we think you'll agree. 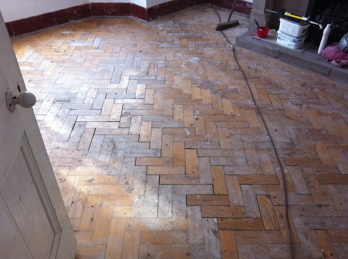 Pine Parquet Blocks in a Herringbone pattern diagonally across the room with no border, this was a quite dramatic transformation to this room. 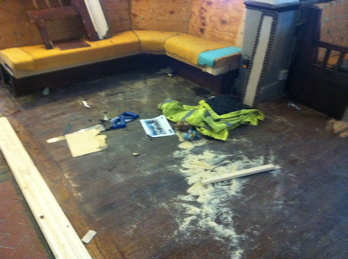 In the before picture you can hardly tell the species of this pub floor, when you see the picture with the finished floor its obviously Oak Strip and doesn't it look good. 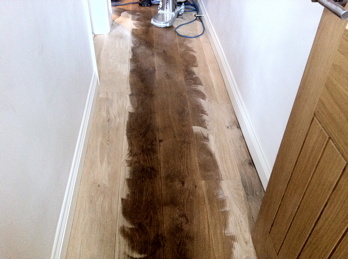 This narrow Hallway with an Oak wide board is completely transformed and looks superb. 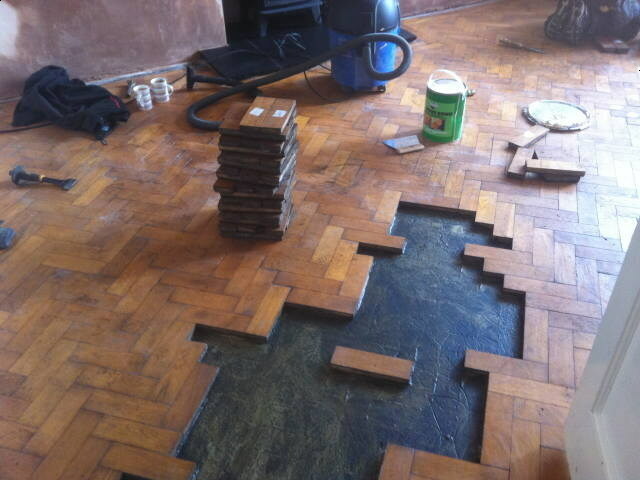 These pictures show what can be done with a pine block floor that many would think is beyond saving, we re-fixed around 3m2 of loose blocks in this room before Sanding and Sealing - what a change !! 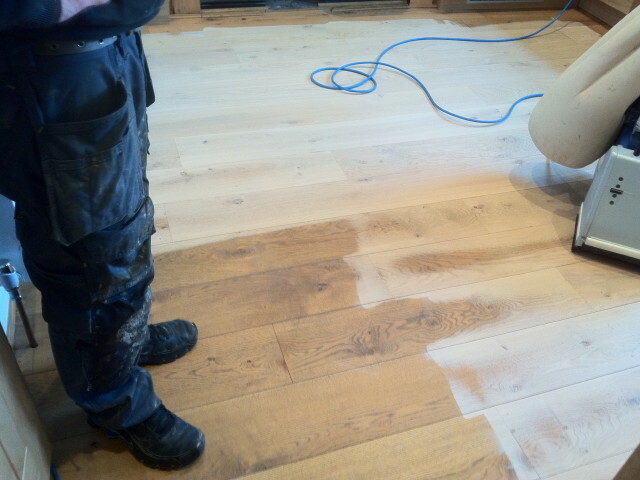 In the first of these two pictures the floor doesn't look too bad, in reality it really did need to be sorted out, thankfully the floor sanded off beautifully and looked tremendous when finished. 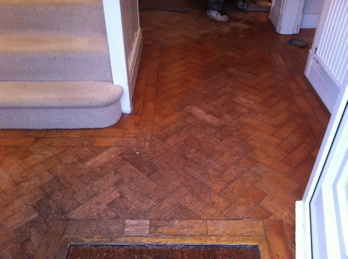 This Columbian Pine Parquet Block Flooring in this Entrance Hallway really did need a full restoration, and didn't the finished floor look good. 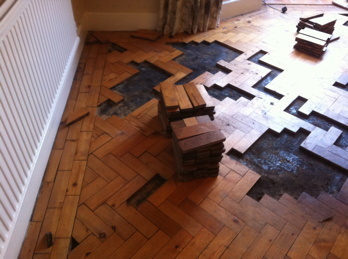 The centre of this picture shows an area of the Columbian Pine parquet floor which we in filled with matching material, the clients wanted the pattern to be half brick so as to create a focal point in the room - We think the after picture looks pretty good. 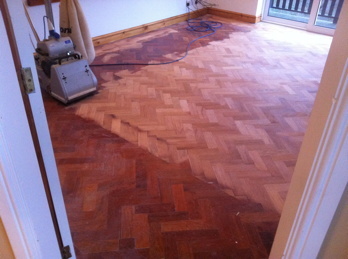 This Iroko Parquet Block Floor was hidden under carpets for many years before our arrival, there were many indents where furniture had been sat and marked the blocks quite badly, thankfully this sanded out and our clients were left with a stunning looking living space that will serve them well for many years. 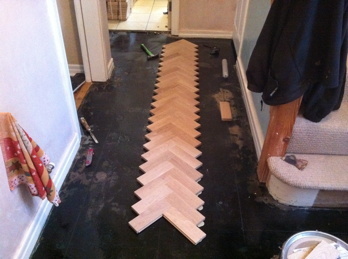 Havwoods new prime oak parquet blocks were used in this new installation for clients in Chester, the finished floor looked magnificent and has completely transformed the space, needless to say our clients were pretty pleased with our efforts - Thanks Jo for your kind hospitality over our time at your property. 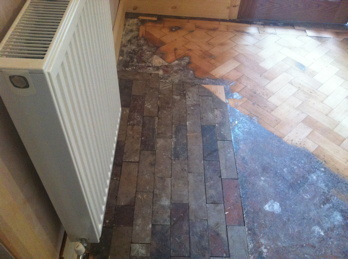 These Mahogany parquet blocks were not in the best condition and certainly needed a full restoration to get the rooms looking back to their original splendour once again - Fortunately we are pretty good at what we do so the finished floor really did look tremendously good - Thanks Anita for your generous hospitality over the two days. 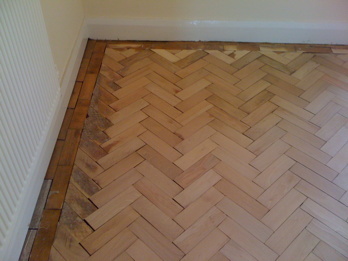 This is the same parquet flooring as the picture just to the left of the above image, Mahogany is a wonderful material to work with and always looks magnificent when properly restored, but come on - doesn't the finished floor look good - this particular floor was finished with four coats of Lobadur 2k Fusion commercial grade wood flooring lacquer. 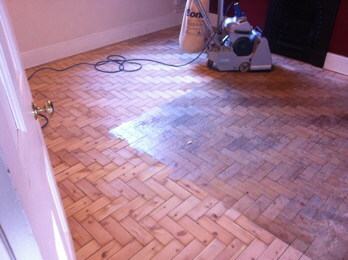 We got quite a surprise when we started work in this room as there were treble the amount of loose pine parquet blocks as we had originally thought, fortunately we mangaged to do all the repairs and preparation work on the day, although we did have to come back the following day to finish off, but it was certainly worth it as the finished floor looked tremendous. 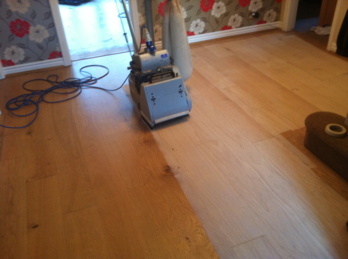 This Oak narrow strip floor had been hidden under carpets for decades and without doubt needed to be renovated, it just goes to show what can be done with wooden floors. 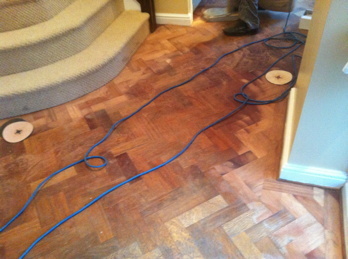 A major amount of remedial work was needed to completely transform this Hallway, the Columbian Pine Parquet Blocks were nearly all loose and needed re-fixing back into position, the preparation work was done to our usual high standard.....how good does it look now !!! 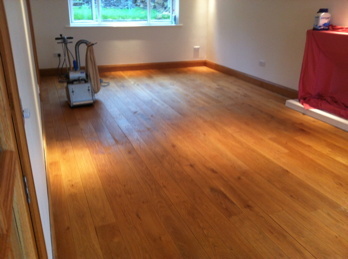 This Engineered Rustic Oak Floor needed tidying up as there were many small scratches and a number of high heel marks which the client wanted removing, this floor sanded off quite nicely and looked superb when completed. 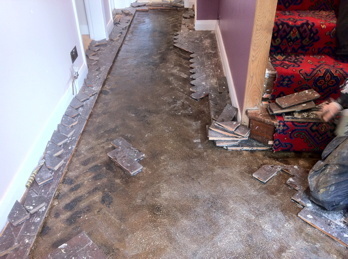 This is the second room from this project, the entrance Hallway had a lot more high heel marks and scratches, thankfully they sanded out and the finished floor looked magnificent. These original Pine Floorboards were in generally poor condition, thankfully they sanded up quite nicely and ended up looking really good. 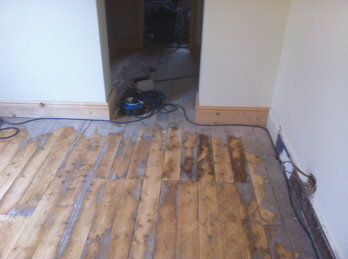 These pictures are of the same room as the pictures opposite but from a different angle, still showing the before condition of the floorboards, then obviously the rollover image is the the room in its finished condition.